To recount the bustle of the last few weeks would be an exhausting and confusing tale, requiring far too many words. The “to-do's” undone and “done-that's” crossed off the list have been, in one way or another: frenetic, disappointing, mirthful, grateful and forehead-slapping, hand-clapping, hand-wringing and brain-squeezing. So, in order to avoid using any more adjectives than a normal person should employ in polite company, I choose to stick to the good ol' adage of a picture being worth a thousand words. With that in mind, here's about 3 million of 'em. 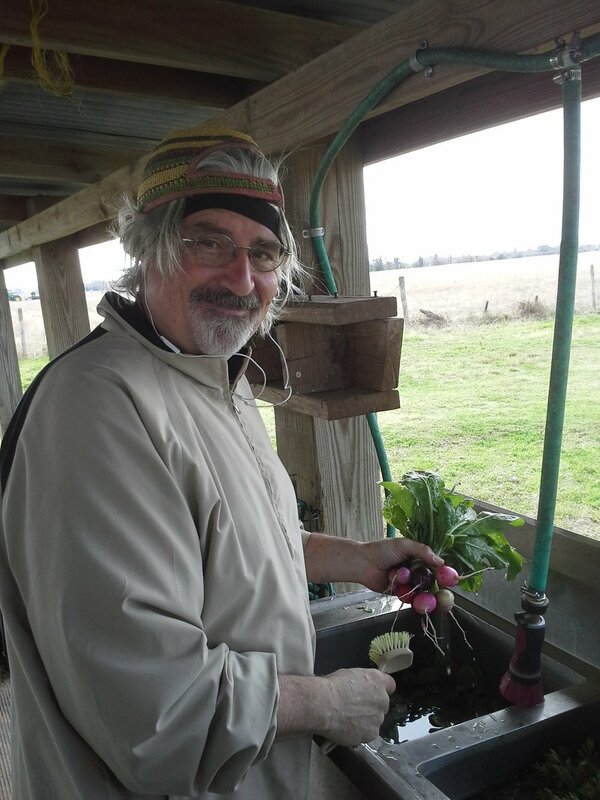 My adventures in the school garden at Early Childhood University on Galveston Island got grungier and even more fun when I took them transplants of veggies and flowers. Every kid got a chance to steward their "own" plant, and we talked about food, using "gentle" hands and how much fun it is to get dirty. Oh, and a grub did poop in my hand. The grandmaster behind all this garden magic is Jessica Antonelli, resident art teacher and fun guru. These kids are sooo lucky. We were amping ourselves up for BOTANY!!!! And then there were the rains. So, so much rain. 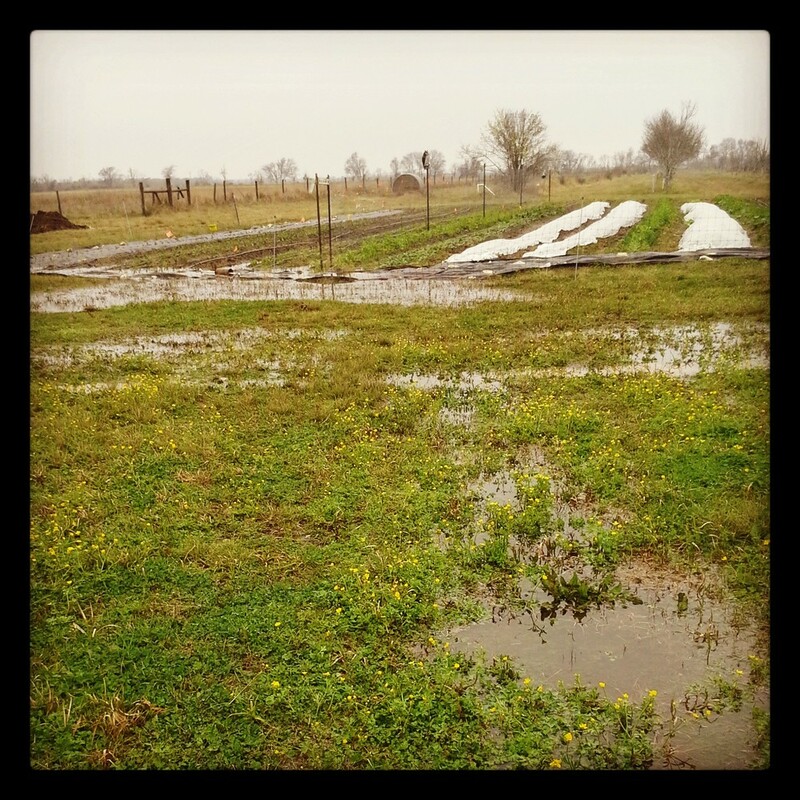 It postponed and cancelled nearly all of our planting plans for a week. But nature does what nature wants, and we're just her fanclub. The snapdragons at last began to bud and finally--FINALLY--the nigella began to bloom. This might not sound like a whoop-de-doo, but DAMN! we've been waiting for these beauties to flower for what felt like an eternity. The green beans continue to pop and stretch their limbs. Hooray! This sweet fella was affectionately dubbed Skeletor, and his lovely girlfriend was Ruby. McFarmer begs me not to name them, but I continue to happily ignore him. We were so glad they found a happy home. We had our very own brush with matchmaking. Tragic as it was to drive up to the farm one morning and find two lost and dreadfully malnourished pups, it was tremendous to find them homes by sunset of the same day. All thanks to the curious, wonderful world of facebook. McFarmer dug another trench for irrigation (this time to the herb garden) and took pains to properly care for his equipment (he was ever-so-thankful to forgo the manual digging this go-round). We began our final harvests of the Fall field, saying "ciao" to broccolis, brussels sprouts, cabbages and more. A rainy farmer's market last Sunday was the official farewell to our colder-weather crops until next Fall. More and more restaurant deliveries kept us busy and thankful. Hooray for Brennan's and Gaidos! We marveled at the crazy beauty that is life. And lettuce. Flower arrangements were made for our good friends (and farmer's market manager), Cate and Brian. ....but ended up a bit more traditional. Of course, how can you go wrong with a few Texas wildflowers thrown in? Oh, and we marveled some more at some more beauty of life. And yes, more family came, and we put them to even MORE work. My sister Julia and brother-in-law Jerry never cease to impress us with their willingness and effectiveness when it comes to tackling any job we throw at them. This time, it was removing the stumps of the older brassicas from the field before tilling. Here's the thrilling action shot of spent vegetables finding their place in a large compost pile. Can you read the determination on their faces? Of course, some family members took a more laid-back approach to the farmwork. Luckily, they make up for a lack of thumbs with an excess of sweetness. And then, the big daddy of all tasks this week: transplanting. Family helped transform the Fall field into our Summer One field, requiring the installation of tomato/cucumber trellises, black fabric as an experiment in combating weeds, and loads and loads of T-posts. Sore shoulders were felt all around. Three varieties of tomatoes were moved from our greenhouse to the ground this week: Sakura, Goldies and Black Cherries. All are cherry tomatoes, for they're our favorite and no one can tell us not to. 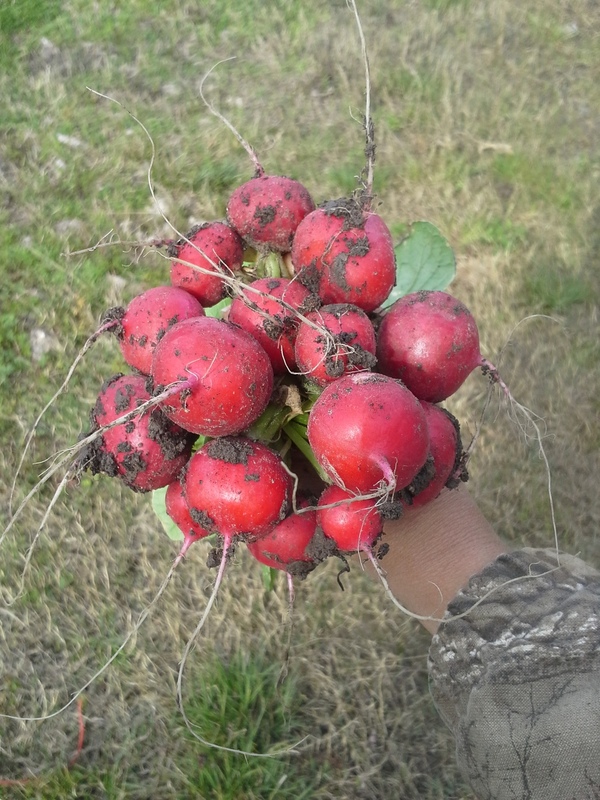 Mass transplantings always give us ample time to bemoan the state of our gumbo clay soil here in the Gulf. I mean, look at that stuff. All we need is a kiln and a different business model. We scheduled another dirt delivery this week as part of our "Fix the Bowl In The Middle Of the Field" mission. Where once the lettuce of Fall was growing, we will now spread the topsoil and set it in cover crop until this year's Fall. Can you smell that basil? Setting those little babes in the ground is a truly reaffirming act. They're so delicate and tender at this age, but you know that in only a matter of days they grow strong, grateful for the chance to root deep. They give and give, stretching our harvest for months and becoming a staple in both our diet and our incomes until late summer. And of course, we do a little more marveling.